We'll be undergoing a bit of a change in the pattern although the highs will push right to 100° once again across the Cookeville area. This could be day #5 in a row. I was amazed by all the haze yesterday while traveling to and from Chattanooga. Did you hear the thunder last night? Did you receive rain? Parts of the Cookeville area did and parts did not. We received a trace of rainfall here last night at MY WEATHER STATION LIVE! As promised above, the pattern is changing. We'll still have the heat to contend with but there is an increased chance of showers to start out Independence Day week. I think you can count on a 20-30% chance on Monday, Tuesday, Wednesday, and Thursday. 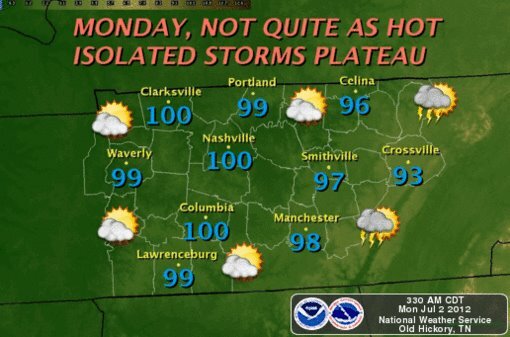 As I stated, it'll still be hot with highs mainly in the mid to upper 90's after today's high near 100°. SHADES OF COOLER WEATHER AHEAD? Let's not get too excited BUT there are hints (and I say HINTS) of a possible cool down out in the 10-15 day range. We are still right in the middle of summer so any cool down would be short-lived and not very cool. After temps in the 100's, highs near 90° would be a welcome relief. We'll keep an eye on this possibility. LIKE the CookevilleWeatherGuy.com on Facebook! We got a pretty decent shower here in the Algood patch last night. A couple of brief heavy rains, and a steady shower of twenty minutes or so. Lots of cloud to cloud lightning. Cooled off a bit.